There aren’t just bands like Rhapsody from Italy. 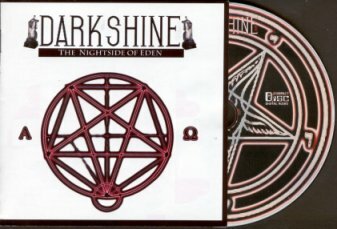 The self-produced Demo-CD “The Nightside Of Eden” from the band Darkshine is the ultimate proof for that. The quintet performs a cool mixture between Melodic Black and Gothic Metal, most of all influenced by Dimmu Borgir and Cradle Of Filth. After a majestic, dark and mysterious intro, which also contains some Matrix-sounds, the titletrack appears and the musical direction is clear. Good that not only the keyboard lays the melodies, but also the guitars take a big part of the atmosphere. Of course the production isn’t super, but for a self-produced Demo-CD it is more than just okay, I heard a lot of official CDs which sound much worse. Just the drums could be more powerful, but beside of that, it’s a great experience to listen to “The Nightside Of Eden”. Krimloths voice is high and intensive and he reminds me a bit to Shagarth during “Enthrone Darkness Triumphant”-times, but of course Krimloth is not just a plagiat. As I said before, the guitars are responsible for a high number of melodies and the six strings do a really good job. The tempo is well balanced, there are blasting parts, but also mid- and uptempo and so the whole album is very well-poised. The music of Darkshine always has this opulent, classic-influenced feeling, typical for Melodic Black Metal but nevertheless original. Some notes also to the closing song “Mother North”, a cover-version of one of the greatest and most characteristic nordic hymns, written and composed by Satyricon. Normally, if you cover a song like that as a young band, you can only lose and the result is most of the time bad to catastrophic. Not so in this case. Darkshine managed to create a convincing cover, I think also because their version is very close to the original. But however, it’s a good end of a good album, with some very strong moments, for example the beginning of “Angst”, the cool key-parts during the song, the vocals of Krimloth and the tons of great and emotional melodies, spreading a feeling of epic and highness, just listen to the beginning of “Awankening Of Tyrants”, which contains also a fantastic part, whrer Krimloth sings in clean voice, very hymnic an impressing beautiful. But there are also some details which could be better, by the way the fact, that you always hear, which bands are the biggest inspiration for Darkshine: Dimmu Borgir, Cradle Of Filth and Co. That’s the point, where Darkshine will have to work for their future releases: more originality, more own note. But hey, this is a self-produced Demo-CD, and Darkshine are just at the beginning of their career, and more important, of their evolution, so I’m very sure that this Italian band will go its way and release some very good and inspiring releases, we only have to give them the time they need and deserve. And listen to “The Nightside Of Eden”.